Reduce sake by one half with peppers, garlic and ginger. Strain and cool. Blend with honey, lime juice, oils. Hold. 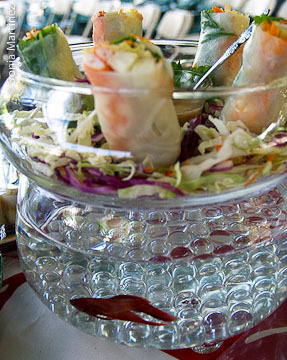 Soak one sheet at a time of rice paper. Brush lightly with sake dressing. 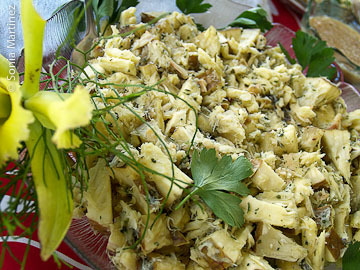 Place 4-5 strips of breadfruit on the round followed by 1 1/2 tablespoons of crabmeat or two shrimp. Sprinkle on 1 tablespoons of carrot and 1 tablespoons of omelet. Garnish with small amounts of mint, cilantro and shredded green onion. Sprinkle small amount of macadamia nuts. Roll up like an egg roll or burrito and place on a sheet pan or waxed paper. Repeat until all 12 rolls are complete. Serve by cutting in two to three pieces accompanied by balance of vinaigrette to which you have added the balance of the nuts. Recommended to be accompanied by cucumber namasu or microgreens. Wash and core 'ulu. Cut into six wedges per 'ulu. Place in pot and cover with water. Add codfish and six Hawaiian chile peppers and equivalent of one whole bulb of garlic. Boil for 30 minutes then remove codfish to drain. continue cooking 'ulu for 20 more minutes. Remove 'ulu from water and let cool. Fry codfish in olive oil until golden brown. Let cool. When cool, debone and shred codfish. Reserve olive oil. Clean and mince one whole bulb of garlic and the four remaining Hawaiian chile peppers. Add the garlic and chile peppers to reserved olive oil and cook for three minutes, then add one pound margarine and 1/4 cup of vinegar to oil mixture. Cook for five minutes then add codfish and Italian parsley. Cut cooled ulu into bite size pieces, mix with codfish mixture and serve. NOTES: It is delicious for "Happy Hour" pupu. 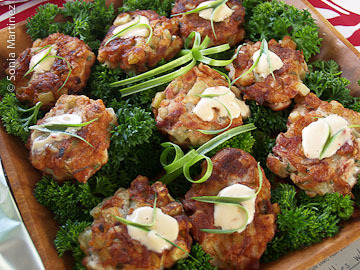 I have tried to use this recipe with sweet potato and taro, however, this recipe was more delicious with the 'ulu.